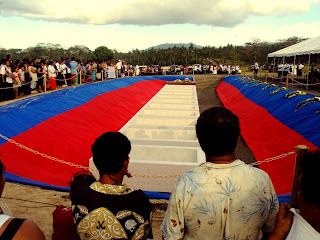 The National Memorial Service for Tsunami Victims was held yesterday, and though it was much larger in scale—the diplomatic corps attended, there were 11 caskets, the Prime Minister spoke, the event was nationally televised—it still followed the same general structure of a Samoan funeral. There was grieving and a sense of loss and lots of singing, and at the end, there were Styrofoam boxes of food for the entire crowd. 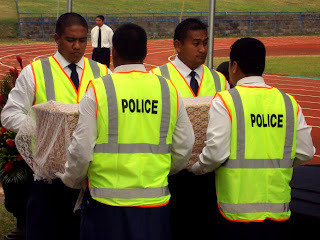 It wasn’t the first time I’ve been to a Samoan funeral. Back in August I went to visit the host family in Fausaga, and we whisked down the road to a funeral in neighboring Vaie’e. 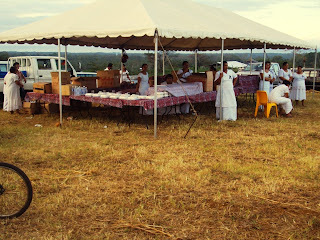 I was underdressed, and Asolima and I spent most of the time in the car, but when it came time, we sat outside the family’s fale and watched the presentation of money and fine mats and corned beef. 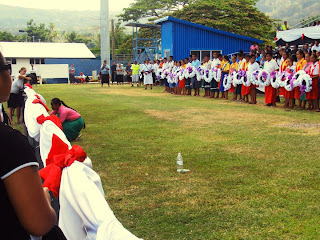 Most often, a fa’alavelave consists of giving money to the family affected. Depending on a person’s relationship to the family, people are assigned the amounts they must give. For example, when Asolima’s cousin died last month, her mother Mele was assigned to give $40, 2 fine mats, and 1 case of corned beef. Asolima and her two children were assigned the same, but as a group. The second part of the fa’alavelave is the family affected usually repays those who gave to the fa’alavelave with money and/or cases of corned beef. With the immense destruction and loss of life caused by the tsunami, individual fa’alavelaves might break the bank. I haven’t heard too much about anyone being required to pay a certain amount, but I don’t doubt it’s happening. 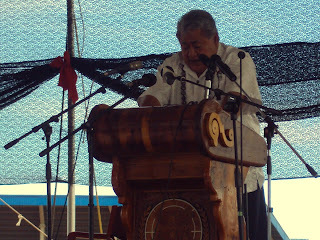 As for the event yesterday, leaders representing the three main churches of Samoa—the Methodists, the Congregationalists, and the Catholics—gave prayers, and the Prime Minister spoke. Student leaders representing schools across the country laid wreaths as the names of the deceased were read. Many students cried. After the service, people crowded down into the grave to cover the caskets in flowers and baskets and packages. In Samoa, death is not viewed with the same macabre weariness that we feel in America; many many people have graves in their front yards. Sometimes these graves are decorated elaborately, and sometimes they’re just large slabs of cement where people lounge in the afternoon. In any case, yesterday’s event seemed to me to hit the right note. I hope you’re well. Pictures of yesterday's ceremony below. The Prime Minister giving his thoughts. Students line up to lay down their wreaths. The spot in which the deceased were laid to rest. TALOFA, uso e, tofaina oe! E ala oe pe a mavae le po. Fa ita ua le uma au feau? O lou Matai o loo ua valaau. There a six verses but mostly you would only ever sing the first two verses and this song can be found in the EFKS hymn book. The basic translation of the song is, Woe to me, my brother you have passed on, your work here is done and now you may rest because your Matai(God)has called you.Goodbye.Goodbye.Goodbye. Thanks for writing this past year - looking forward to the next 365 entries. Stay safe. You are thought of often. P.S. Thanks for making me feel better about my accident. Thank you for your awesome blog which us 'islanders' from afar are thankful to be accessing. Malo lava for the wonderful work you've done in the last year, and may you have a more positively, safer and adventurous year ahead. Love your writing!! I now look forward to reading your blog first before the Observer online! !